Simulation of a Schmitt trigger. 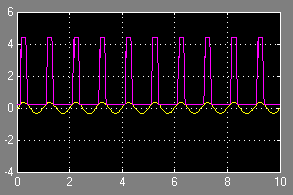 The yellow sine wave is the input, the purple square wave is the output. I was looking for a way to convert an analogue signal into a digital signal, and came across the Schmitt trigger. This is a great little circuit that you can build with a couple transistors or with an operational amplifier. I tried to build a transistor-based simulation in Simulink, but it didn’t work right away. My op-amp simulation did work, so I stuck with that. The principle is simple: if the trigger input rises above a certain threshold, then the output saturates to the op-amp’s positive power supply voltage. When the input falls below another threshold, the output saturates to the op-amp’s negative power supply voltage. If the input lies between the thresholds then the output doesn’t change from whatever it was before. This is incredibly useful. To the left you can see a 0.3 V sine wave being converted into a 5 V binary signal (actually a 4.5 V signal, since I added a diode in series with the output to keep it from going down to -5 V). It also effectively filters out any input jitter that doesn’t cross the threshold needed to change the output state. Microcontrollers have Schmitt triggers on their digital inputs. For example, an AVR microcontroller being powered by 5 V typically considers a 0 logic level to be under 1.5 V and a 1 logic level to be over 3 V. If the input sits between 1.5 V and 3 V then the digital state remains whatever it was before the input entered that region. Alas, it’s not a perfect circuit. I used an online calculator to figure out what resistances I needed for my project. Configurations that worked in the calculator and in simulation didn’t work in reality, either producing no output or something more like a sawtooth wave than the square wave I expected. It’s probably a limitation in my op-amp—maybe the signal is too high-frequency, I didn’t investigate very deeply. This entry was posted in Miscellaneous and tagged crazy stuff, filters, neat circuits, op-amps, schmitt triggers on December 2, 2010 by Neil MacMillan. This entry was posted in Miscellaneous and tagged inane traditions on October 30, 2010 by Neil MacMillan.